Jensen Hobley celebrates winning 'Wasp of the Week' at Wasps' Playing Advantage programme. WASPS Rugby Club have been praised for their community programme in changing the life of a Coventry boy, as the scheme celebrates two years of existence. Jensen Hobley, an 11-year old, has autism and learning difficulties and has become a regular participant in Wasps’ Playing Advantage sessions – which are targeted at providing young people between the ages of six and 16 who have various learning disabilities with the opportunity to take part in different sporting activities that they otherwise would not be afforded. The programme was founded on Sunday 20th January, incidentally the same day when Wasps clash with the reigning European champions Leinster Rugby at the Ricoh Arena (3:15pm), with a giant cardboard cake from DS Smith – a funder of the initiative, to be presented to participants who have benefited from the scheme. Emma Hammond, Jensen’s mother, has been highly supportive of the programme provided by Wasps, and has revealed her son has developed enormously since attending the sessions. “Jensen has gone from feeling isolated and shy to a confident and sociable young man,” she said. Hammond spoke of her son finding a passion for rugby and becoming a Wasps regular as a result of the programme, and has only missed a couple of sessions over the course of two years, being one of 35 young people who attend on a weekly basis. “Playing Advantage is one of the best things to happen to Jensen – it has really helped to bring him out of his shell and live life to the full” admitted Hammond. 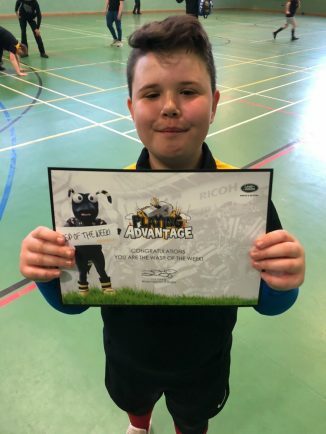 Through attending Playing Advantage, the 11-year old has played similar sides in Oxford and at Saracens Rugby Club, whilst also playing for Broadstreet RFC’s Mixed Ability side. Community Development Officer at Wasps Jordan Young was influential in founding the programme, and has been reflected fondly on the two-years that have passed since then. “Seeing Jensen’s progression since we began shows us exactly why we put on these sessions. Young is now looking ahead to developing the scheme further, with an international festival in Belfast this summer set to feature a Wasps Disability Tag Rugby team for the first-time ever. Playing Advantage sessions take place every Sunday morning between 9 and 10:30am, held at King Henry VIII School Sports Centre, with interested participants urged to email jordan.young@wasps.co.uk for more information.